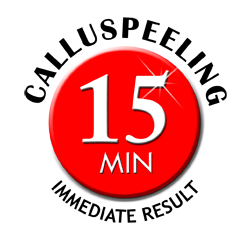 CALLOUSNESS AND DEAD HARD SKIN JUST EFFORTLESSLY PEEL AWAY IN ONLY 15 MIN! Without the use of blades or drills, CALLUS PEELING completely removes cracked hard and calloused skin simply and rapidly. These problems cause pain and discomfort as well as being an aesthetic problem. CALLUSPEELING is a delicate and pleasant treatment, which gives a new shine and an extraordinary softness to the feet. It’s easy to perform as it does not require particular knowledge. It is simple to follow the instructions for immediate results the firs time. The absence of blades avoids any danger of bleeding, meaning the treatment can be performed by trainee or less experienced therapists. during normal pedicure instead of blades, cutters or drills. The time saved is significant: while patches are on the feet, nails can be filed and cuticles treated. When compared with traditional methods results are significantly better in a reduced timeframe. during a facial or body treatment while waiting for masks to work or during a body wrap treatment. Lie back and relax, while your therapist places the Callus peeling patches to your feet and then wraps them up. You will then receive a 15 min neck and shoulder rub while your patches are working. Your patches are then removed and the hard skin is literally peeled away. Enjoy a refreshing foot massage to finish. You can even add Nail Lacquer or gel to finish your beautiful new feet off. Full Callus Peeling treatment including 15 minute neck & shoulder massage. Full Callus Peeling treatment including 15 minute neck & shoulder massage & Lacquer Pedicure. Full Callus Peeling treatment including 15 minute neck & shoulder massage & GelColor Pedicure. It was like having new feet, such a lovely relaxing treatment! With amazing results.